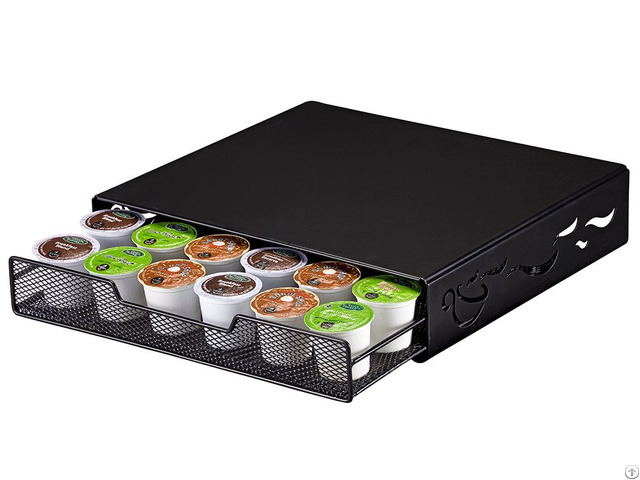 【One Day A Cup of K-cup】Storage Drawer with 30 pods K-cup, you could enjoy the, Keurig coffee every day and you'll always know when you're running low on coffee and it's time to restock. 【Save Your Place】Store all your coffee pods inside this stylish coffee maker shelf. Your coffee maker sits on top of the shelf while your coffee pods store neatly away in the wire rack underneath. The black color will look great in any kitchen. 【Easy to clean 】 Being in the kitchen, your K-Cup holder may get dirty - not to worry, you can simply wipe the tray clean with a damp cloth. The Storage Drawer is the ultimate space saving storage solution. Simply place your brewer on top of the unit and store your pods without taking up any additional space on your counter top. As an added convenience, the unique wheeled rolling system allows you to push your brewer forward and backward under your cabinets with ease.